Fast setting, expanding repair mortar – Koster Repair Mortar Plus is a watertight, fast setting, slightly expanding repair mortar with excellent adhesion (even to old building material substrates). 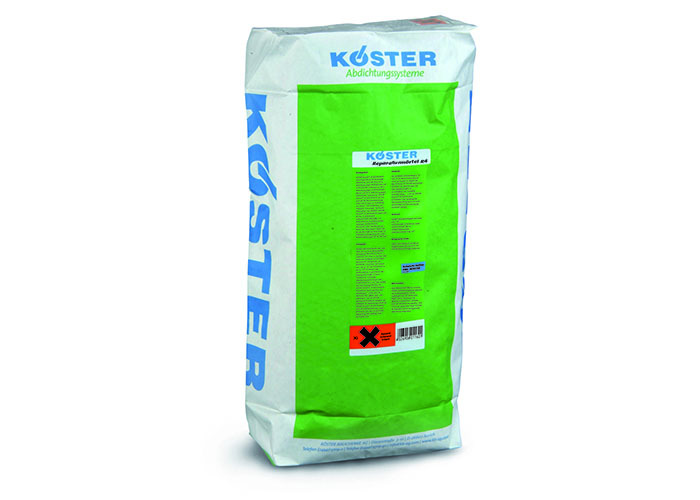 With the addition of Koster SB Bonding Emulsion, it can be used as a PCC (polymer-modified cement concrete) mortar. Repair Mortar Plus is intended for the execution of watertight repairs and touch ups. It can be used for the installation of fillets in the wall/floor junctions which are exposed to pressurized water prior to the application of bitumen thick film sealants such as Koster Deuxan Professional and Deuxan 2C, and cementitious slurry systems such as Koster NB 1 Grey. Repair Mortar Plus can be used for underfilling machine foundations as well as for filling blowholes, cracks, tie bolt holes and oversized joints.